Interested in learning how to build Drupal sites, too? Check out our role-based learning pathway: Build Drupal Sites. How do you define the Drupal site builder role? Everything that doesn’t include coding. 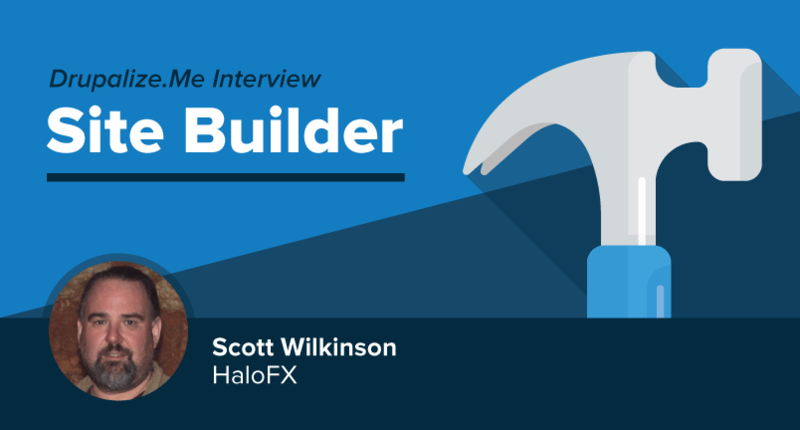 I don’t like the term "site builder”—it doesn’t make sense. Everyone who is involved in the creation of a site is actively involved in building the site. It’s also picked up a stigma of being a “lesser than” role. I am a hopeless generalist. I love the web and Drupal, it’s the core of my business, but I get bored easily. So I also still do print work, photography, and general consulting. I recently resurrected my interest in hand lettering, and have even done woodworking and welding for clients! Every day is different. The only constant is that I don’t sleep much. Everything! As an independent freelancer, I’m usually the only one with contact to the client. It’s typically my responsibility to pull in others to help cover tasks I may not be best suited for, such as copywriting, illustration, or custom code. Lyza Gardner recently summed it up in her Responsive Day Out talk “The virtuoso generalist”: "Generalists are the people you hand off work to, knowing they don’t know how to do it, and knowing they’re going to get it done anyway." I suppose I hone that skill by always seeking out interesting, new things to learn. Nerd from Day One! I destroyed all my toys, because I had to know how things worked—then I learned to create more than I destroyed. I learned Basic at age 10, in a college night course. I taught my teachers to use an Apple 2e, and discovered the Internet through a VAX terminal in 1991. I was at Art School when the web showed up, and was hooked the first time I did a “view source” in 1993, on Windows 3.1 and the Cello browser! I realized “I can do this!” and never looked back! What is most challenging about being a Drupal site builder? Keeping up. New modules, methods, frameworks, things not working, chasing the issue queue… Finding balance between “should I use these 3 modules, or have something custom coded?” Since I work mostly on my own, I tend to pick the 3 modules, which don’t always work as advertised. Often something is broken, or backed up for months or years in an issue queue. Sometimes there is a patch that I will try. Sometimes there’s some obscure line of code mentioned, but not enough info on where or how it should be used. Often, there is just nothing. Favorite general tool for almost all disciplines is a pencil, and a Moleskin notebook. Resources specific to Drupal: I read a lot of Drupal Planet, I understand about half of it. Listen to a lot of podcasts: A List Apart, Five Simple Steps, Modules Unraveled. Tools Related to Drupal: Drush, Sublime, a desktop computer with 4 - 24” monitors so I can spread out all the browsers windows, email, file folders, notes, editors, terminal windows and such required to just build a Drupal site, none of which is really coding related, with the exception of simple theming—mostly just Sass. The local Drupal Meetup and camps have proven invaluable to staying plugged in. I have been to two Drupalcons (Denver and Austin), and while it’s nice to be around other Drupal folks, I find it not that beneficial for non-coders. However, I did really enjoy the sprints. If you were starting out as a Drupal site builder all over again, is there anything you would do differently? Hard to say. I think the nature of Drupal requires you to flounder a bit as you find your footing. I learn best this way. It would have been nice if there had been a local group and camps I could have attended at the very beginning. What advice do you have for someone just starting out as a Drupal site builder? Don’t work in a vacuum. Surround yourself with other Drupal folks, and ask the stupid questions. The odds are everyone else asked the same stupid question once, also. Don’t be afraid to read the stuff that doesn’t make sense. Even if I have absolutely no interest in coding anything with Composer, it’s still helpful to have a 1000 ft. overview of the big picture.